Il Ballo dei Giganti di Nola (2015), 90 min. For centuries the Feast of the Gigli has been celebrated in Nola, near Naples, every June in honor of Saint Paulinus. 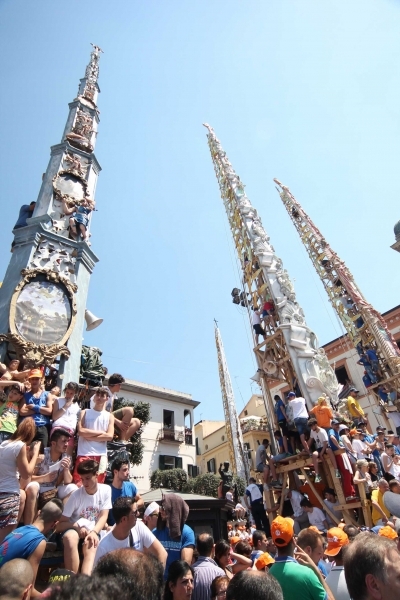 The feast features the “dancing” of the multistored gigli towers, which represent lilies and are lifted and carried by “crews” of local men. Each year hundreds of Nolani migrants and their families return for the occasion. Antonio Iorio’s film (in Italian with English subtitles) accompanies the Fraulillo family who visit from Northern Italy, where they live, to take part in the beloved feast. Their story is the framework for the film’s exploration of the self-discovery echoed in long-held sentiments by the participants of the annual giglio feast in Williamsburg, Brooklyn. Post-screening discussion with the director led by Joseph Sciorra, Calandra Institute, Queens College, CUNY.